Last time we have covered the very basics of Phoenix framework. We have managed to install a development environment and create the new project. Today we will proceed and build the basic application layout. As soon as we are building the chat application it would be nice to have rooms to separate conversations between users by topics or by groups of people. We are going to build a layout similar to the following mockup. We have navigation bar there with the logo on the top of the page. The list of the rooms on the left side and the working area in the middle. To do that we need to become familiar with the views and controllers. What exactly are views and controllers? The Phoenix framework implements the MVC architectural pattern. Where MVC stands for Model-View-Controller. MVC pattern splits the application into three components. Those components have their own mission and mostly hide private details from others. The Model provides the raw data for the application. It hides the details of a data source. The View uses that data to nicely display it. The view does not care where the data comes from. It only cares about a rendering of that data. To present it as a table or as a list. The Controller manipulates views and models. It figures out what does a user need, grabs the data from the model (if needed) and passes it to the view. The controller does not care where the data comes from and it does not care how the view will represent it. It simply says “Hey Model, please give me all available rooms you have”. And then “Hey View, here are the rooms, please render those rooms on the page”. On the following picture (from Wikipedia page about MVC) you can see the diagram of interactions within MVC pattern. Now as we understand the meaning of Views and Controllers we can proceed and implement the app interface. We are going to display rooms list. So we need a corresponding controller for that. The controller in the Phoenix it is a module with additional functionality. The controller, in turn, consists of actions. Actions are functions of that module, which represent, well, different actions. By convention, Phoenix uses singular names for controllers followed by Controller word. In our case, it would be RoomController. There is also convention regarding actions. We can name them whatever we want, but there are set of names it is recommended to pick from. Based on that, index is the best name to use for rendering the list of rooms. To see a page, a user needs to visit particular URL. That URL should be somehow linked with the particular controller action. Phoenix application has a Router module which describes URL routes. Which, in turn, matches the request with the controller action. We will talk about Router in one of the following articles. For now, let’s just update our root URL to point to our new controller. By doing that, we are linking the GET HTTP request of the root URL (in our case it’s “http://localhost:4000”) with the action index of the RoomController. That is correct. We don’t have the controller yet. Controllers located in web/controllers directory (at least for version 1.3 which I am using at the moment). We have defined the module for our controller. If we go back to the page, what would we see? Phoenix tries to use that module as a controller, but some functionality is missing. That means we need to extend the module to add that functionality. We have extended the module so it can behave like a controller. Now we need to define an action inside our controller. The actions in Phoenix receive two arguments. The first one is always conn which hold an information about the current request. The second argument is params which is a map contains parameters passed with that HTTP request. We find out we need to define a view. You can also see that Phoenix expects that view to be named as RoomView because we are using RoomController. That is also the convention. We see that Phoenix looking for index.html template in the lib/prater_web/templates/room directory. 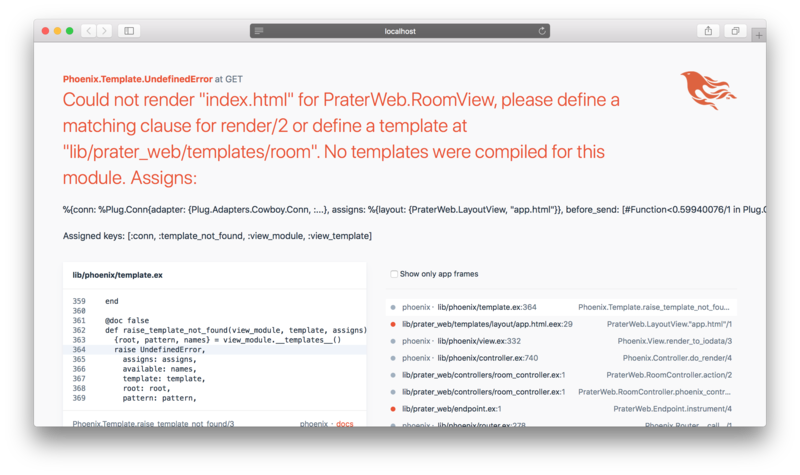 Phoenix knows that there is a RoomView but there are no corresponding templates we want to render. No templates were compiled for this module. What does that exactly mean? Let’s try to figure out. When we compile our Phoenix application, Phoenix walks through defined view modules. For every module, it cuts out the View suffix and gets the name. That name would be Room for our RoomView module. Then it looks for room (lower case name) directory inside lib/prater_web/templates/. Inside room directory it gets every template file and compiles into a render function inside RoomView module. Which we have called from our index action. So we still missing the template. 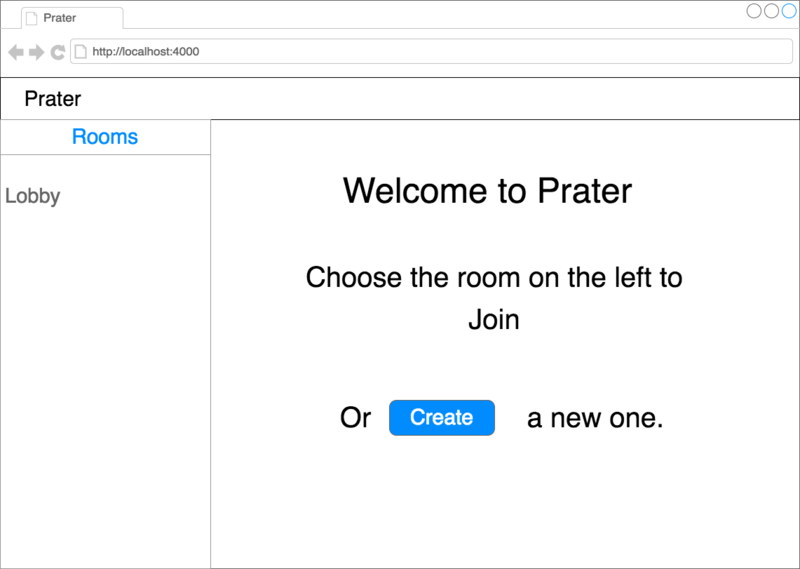 Let’s create the room directory and the lib/prater_web/templates/room/index.html.eex file inside it. Leave it empty for now. The eex extension of the file stands for Embedded Elixir. It allows embedding the code inside a string. We will talk about that more in the future articles. Now we see the error has gone and we see a blank page. There is also one thing it is worth to talk about. The layouts. Currently, we have a blank template file, but our web page is not completely blank. We still have Phoenix logo on top of the page. So where does that comes from? If we look into lib/prater_web/templates folder we would see there is another folder layout with app.html.eex file inside. If open that file we can see there is a complete HTML template in that file. It has HTML tags such as <html>, <head>, <body>. So this file represents the general layout for the application. If we want to have some common elements (such as logo or navigation menu) from page to page, we don’t need to duplicate them on every page. We can keep it in the layout file. That is the place where templates are being injected. All the stuff before and after would be the same from page to page. Let’s focus on the header of our application. As soon as Phoenix uses Bootstrap v3.3.5 (at the time I am writing that) that should do the trick. You should see the new header now. There are few steps left to finish our layout. We want to see the list of the rooms on the left and working area in the middle. Let’s do that. We are using hardcoded “Lobby” room here. But that is all we need for now. Today we have made a big step forward. We have got familiar with MVC pattern. We have walked the path from requesting a resource (by visiting certain URL) to the controller and its action, then to the rendered view and the HTML page displayed back to the user. By learning that we have set the solid foundation for the next steps. It is important to understand how to work with controllers and views. By building web application you will use these pieces quite often. See you in the next articles. P.S. You can grab the code from the GitHub page.